Hi friends! I hope you are having a great week! We are having a little adjustment period with Brady going back to school but I'm sure we'll get it. Then we'll have Christmas break. LOL! Did you hear me shriek the title of this post?! What's more me than penguins and puffy pink tutus? Nothing. Seriously. Here's my first "official" Amber Ink post. I used the darling Gumdrop Penguins - Just Dance Girly. I love this little cutie! 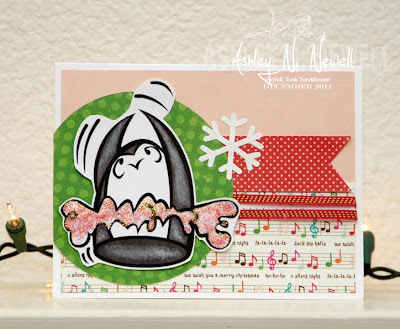 I used this week's Sweet Sunday Sketch 145 for this card. The paper is from Echo Park, ribbon is May Arts, and the sticker is Doodlebug. i didn't see this cutie yet in the store! SO CUTE!!!! Adorable card! Congratulations on being a torchbearer! You have made her come to life! Oh my goodness, what a super cute image! Love this! Fantastic job with the sketch this week!